Honey bees and the process of making honey and related products is a topic worthy of a million words, not a mere thousand. Nevertheless, after you’re done reading this micro introduction, you will, be inspired to learn as much as possible about these amazing insects, especially now that you can be your own backyard beekeeper in the City of Milwaukee. Many people shy away from honey bees, mistakenly lumping them together under a generic “bee” category including wasps, hornets and bumble bees. Honey bees truly are in a class by themselves in the insect world, though. They provide invaluable pollination services to a great many edible and decorative plants. Honey is prized for nutritional and health-related properties. And the associated products of beekeeping such as bee pollen, royal jelly and beeswax can be used for medical and personal care purposes. By nature the honey bee is a docile creature, devoted entirely to the production of honey. Honey bees can sting only once because they die after their barbs are ripped from their bodies. Understandably, they generally reserve their stings for instances when their hives are under attack and they feel truly threatened. Koenen is keen on spreading the positive buzz about bees. When the bees collect pollen and nectar from one plant that they’ll use to make honey once back in the hive, they can’t help but leave some of it behind on the next flower or plant they visit. Thus, the process of pollination. Propolis is another byproduct of honey production. The bees gather resin and sap from trees and plants, mix it with enzymes in their heads and create a sealant they use inside the hive. Aristotle gave the substance its name, pro-polis, meaning “support of the city.” It since has been found to be a cure for the M1H1 virus, among many other positive qualities. It’s likely Aristotle was actually referring to the support of the honey bees themselves, which have had a very positive reputation in every culture going back tens of thousands of years. The City of Milwaukee made beekeeping legal in 2010. 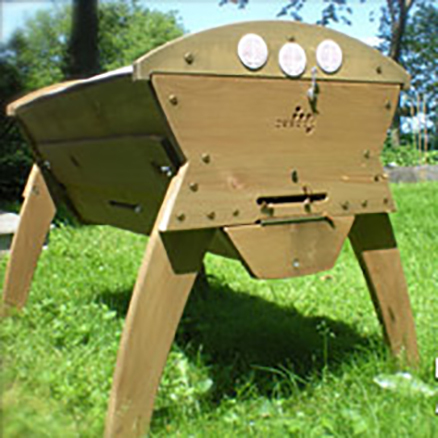 The Department of Neighborhood Services (DNS) (city.milwaukee.gov/dns) oversees the issuance of the necessary permit, at a cost of $70 per year, which allows you to keep up to two colonies or hives of honey bees on your property. DNS will require proof of beekeeping competency before they issue a permit. The process of getting a permit from DNS involves a few additional steps. You will need to provide a simple map of your apiary (your hives) and the surrounding area, including dimensions. Neighbors within 200 feet will have a chance to share any concerns they might have. If your proposed hives would be situated within 50 feet of your immediate neighbors’ homes, you also might need to get their written permission to erect the hives. The University of Wisconsin Cooperative Extension is the home of the Urban Apiculture Institute (milwaukee.uwex.edu/agriculture/beekeeping). The Institute focuses on the science of keeping bees and offers classes at both the introductory or “worker” level, and a more advanced, “queen” level. The Introduction to Beekeeping class already has taken place for this year, but it’s a great program to keep in mind for next year (usually in February or March), if you want to plan ahead. Harris Byers, one of the instructors for the classes, hails from Georgia, where home beekeeping is much more common than it is in northern states. He strongly encourages any prospective beekeepers to take some kind of class to get started. Working with honeybees’ natural tendencies came somewhat naturally for Benji and Corey Timm, who live in Riverwest. Benji’s dad, a beekeeper in Two Rivers for many years, gave the couple a hive set-up as a wedding shower present. Both Benji and Corey successfully completed the class at the UW-Extension through the “queen” level, and keep some of their hives on the Extension grounds. They also have two hives at a business in the Menomonee Valley, a contact Corey made through her job with Menomonee Valley Partners. The business owner wanted to install a prairie type landscape around his building. The Timms maintain two hives there, the honey bees pollinate the prairie plants, and everyone enjoys the honey and Corey’s wonderful beeswax soap and lip balm. Corey was the first person in the city to get a permit last year. She worked with DNS staff to fine-tune the permitting process. The hives the Timms maintain will produce about 120 pounds of honey in a good year. Last year, because it was so rainy, the output was only about half that, at 60 pounds per hive. They have learned quickly about urban wildlife that are fans of honey and how to protect their hives from them, including skunks, raccoons and mice. Benji and Corey always are learning new things about the magnificent creatures that very quickly have become a big part of their lives. Publishers Note: Peggy Schulz was a frequent contributor to the Riverwest Currents and other publications in Milwaukee. She was the kindest person and passed away too soon. We miss her and hope you enjoy her writing on bees from 2001.